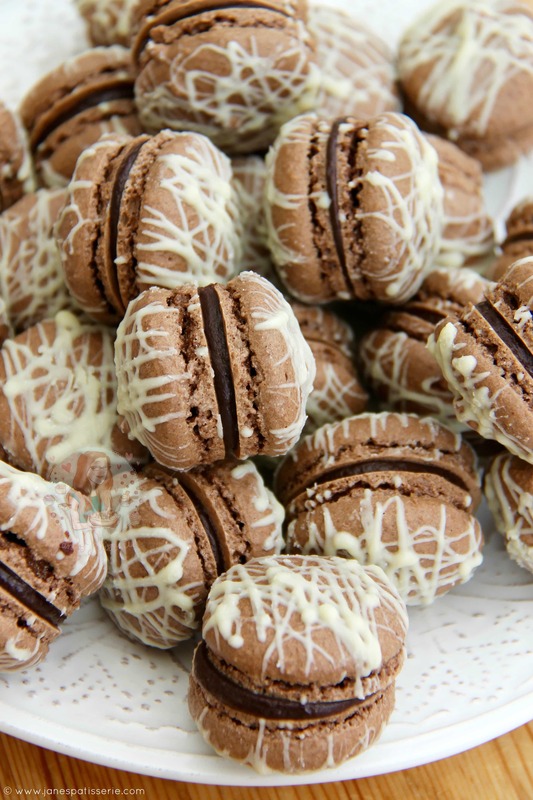 Chocolate Milkshake Shells, Chocolate Ganache, Chocolate drizzle… Triple Chocolate Macarons! 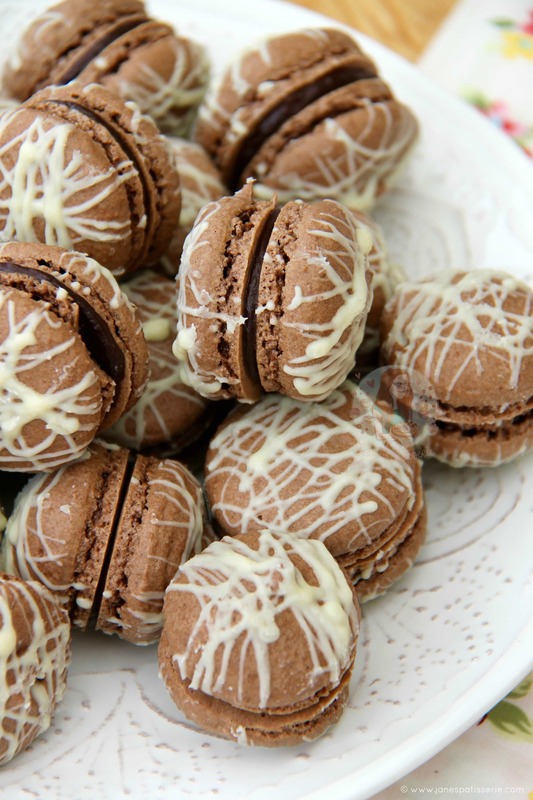 If you know me well enough you will realise that I adore Macarons ever since I discovered that they taste amazing (I used to think they were disgusting because ewww nuts) but oh my I was so so wrong. My Salted Caramel Macarons have always been popular on my blog as my readers have commented that my Recipe & Method are easy to follow, and they always lead to success! 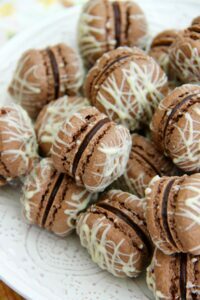 Even with my first few attempts at Macaron’s being slightly faily, they can always be a bit of an odd one. It seems so silly to have to process the sugar & almonds in a food processor, and then sieve the ingredients (maybe even twice) but it is so worth it. 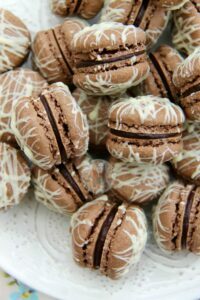 I know a lot of my readers have struggled with Macarons in the past, but honestly its worth trying again till you succeed. Making the Meringue is simple – whip the egg whites up to stiff peaks, and add the sugar 1tsp at a time till its all in, whip some more and its done. The Sugar & Almonds have to be sieved and pulsed as I said earlier, but its worth it! Folding through everything as little as possible is the key for me, piping the macarons, tapping to get the air out and then waiting the full hour for the skin to form. Waiting the hour has always proved successful to me – I have tried 15 minutes, 30 minutes, and 45 minutes and they can sometimes fail – an hour is my ideal! I went for a ganache in the filling to make it even more chocolatey, and that is fairly simple itself. 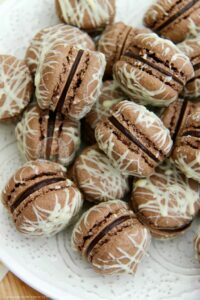 As its so little, I microwave the cream and chocolate together in short bursts, stiring in-between each burst till smooth. It might seem slightly runny at first but it’ll sandwich the shells together perfectly and make them super deliciously tasty. However, if you prefer buttercream then that’s easily done too! But seriously, I honestly think these are worth a go if you can – they are such a decadent treat that is so much more worth it to make at home then buy when you’re out, the cost difference is amazing! Enjoy! 1) For the Macaron Shells – Pulse the Sugar & Crumbs Chocolate Milkshake Icing Sugar and Ground Almonds in a food processor for 90 seconds or so, and then into a large bowl, sieve the ingredients (maybe even twice if its still lumpy) and leave to one side – its VERY important to sieve them! 3) Once incorporated continue to whisk for 5 minutes until its smooth and light! 5) Using a Piping Bag and a 1cm Round Nozzle, pipe the Macarons either onto a Macaron Mat using the guides or a lined baking tray with parchment paper underneath! The mixture is quite runny, so be careful that it doesn’t go everywhere or you make the shells too big! 8) Once the shells have cooled – remove carefully from your trays and line them up – drizzle on some melted White chocolate with a disposable piping bag with the end snipped off – leave to dry! 9) Once dry, in a heatproof bowl, microwave the double cream and dark chocolate in 20 second bursts until smooth, pipe a small amount into the middle of a shell and push another one on to form your classic filled macaron! **I used Sugar & Crumbs Chocolate Milkshake Icing Sugar as I wanted to try it out, but if you can’t access it, you can use 185g of Icing Sugar and 15g Cocoa Powder! I sometimes find that ‘Macaron Mats’ are harder to use than just parchment paper as sometimes they can stick – so I would recommend using parchment paper – but you can buy some silicone sheets with macaron shapes drawn on them already – Like this Macaron Mat – or you can draw the circles yourself! 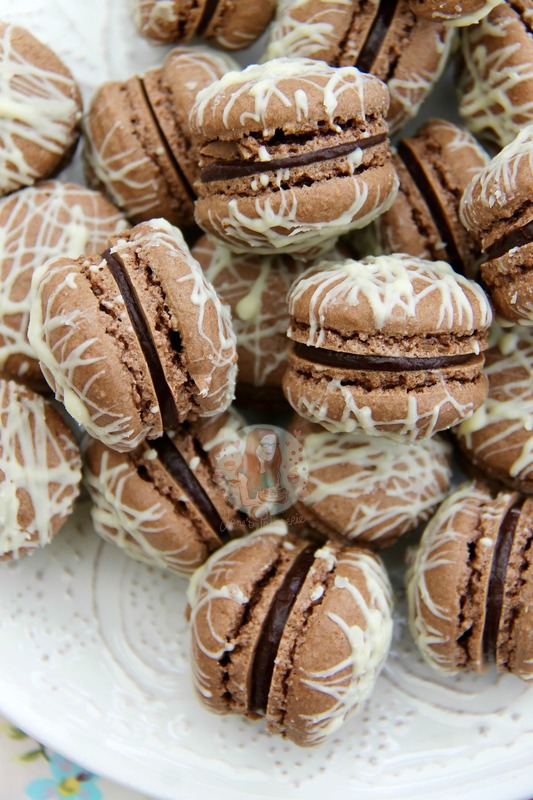 Find my other Cookie & Macaron Recipes on my Recipes Page! Older Next post: Wimbledon Strawberry Cupcakes! Newer Previous post: Salted Caramel Drip Cake! 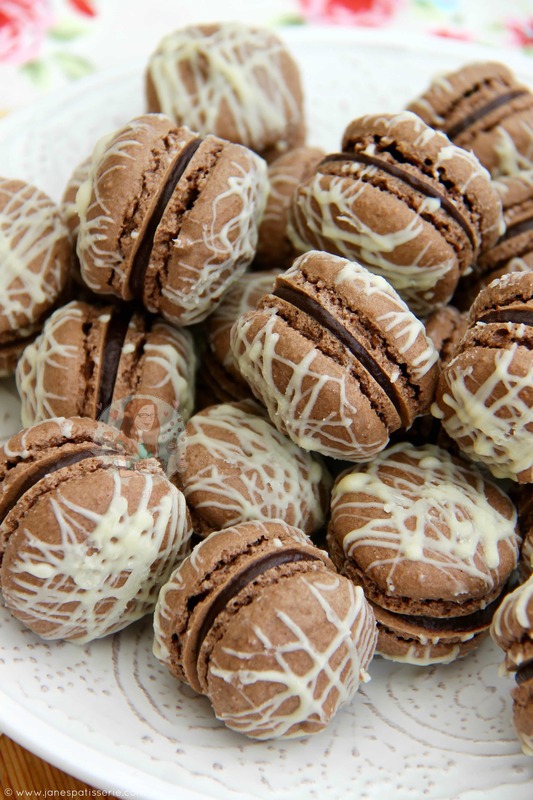 when you say 25 macarons….does that mean 25 filled or 25 unfilled? im presuming its 25 filled or else you would have one left over…? Would it work with chocolate orange flavoured icing sugar? This specific post was featured on WordPress Discover and I’m glad it was. I scrolled and scrolled until I found it here. Everything looked so delicious, and that’s not an understatement, literally everything looked “wow”. I’ve never had a macaroon before. These look spectacular, hope to try and possibly make some that look at much of a delight at yours. Oh thank you so much!! I love Macarons – they’re so so yummy!